This article is about the novel. For other uses, see White Fang (disambiguation). White Fang is a novel by American author Jack London (1876–1916) — and the name of the book's eponymous character, a wild wolfdog. First serialized in Outing magazine, it was published in 1906. The story takes place in Yukon Territory and the Northwest Territories, Canada, during the 1890s Klondike Gold Rush and details White Fang's journey to domestication. It is a companion novel (and a thematic mirror) to London's best-known work, The Call of the Wild, which is about a kidnapped, domesticated dog embracing his wild ancestry to survive and thrive in the wild. As early as 1925, the story was adapted to film, and it has since seen several more cinematic adaptations, including a 1991 film starring Ethan Hawke and a 2018 Netflix original. White Fang, the novel's protagonist. A wolfdog who was born wild but becomes more dog-like after Grey Beaver domesticates him. Grey Beaver, a Native American chief who is White Fang's first master. Beauty Smith, the main antagonist of the novel and White Fang's second master. Weedon Scott, a wealthy gold hunter who is White Fang's third master and the first one to truly show affection towards him. Kiche, White Fang's mother; she is known as the "she-wolf" at the beginning of the novel. Lip-lip, a canine pup who also lives in the Native American village. Jim Hall, an escaped convict. Critics have identified many underlying themes in the novel. Tom Feller describes the story as "an allegory of humanity's progression from nature to civilization." He also expresses that "the [story's] implication is that the metamorphosis of both the individual and society will require violence at some point." Paul Deane states that "[in the novel,] society demands a conformity that undermines individualism." London himself took influence from Herbert Spencer's words: "survival of the fittest", as well as Friedrich Nietzsche's idea of a "superman" (or "superdog", in this instance) and of "the worship of power". The novel is partly an autobiographical allegory based on London's conversion from teenage hoodlum to married, middle-class writer. In writing it, he was influenced by the ideas of Herbert Spencer, Karl Marx, and Friedrich Nietzsche. Conditions in the US also influenced the story. Since the novel has been published it has been translated into over 89 different languages and released as a three-volume Braille edition. Upon its release, White Fang was an immediate success worldwide, and became especially popular among younger readers. 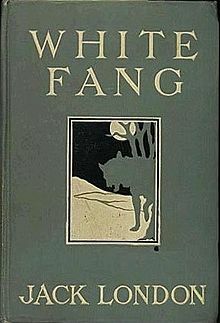 Robert Greenwood called White Fang "one of London's most interesting and ambitious works." Virginia Crane claims that the novel is "generally regarded as artistically inferior to its companion piece [The Call of the Wild], but [that it] helped establish London as a popular American literary figure." I have been guilty of writing two animal—two books about dogs. The writing of these two stories, on my part, was in truth a protest against the "humanizing" of animals, of which it seemed to me several "animal writers" had been profoundly guilty. Time and again, and many times, in my narratives, I wrote, speaking of my dog-heroes: "He did not think these things; he merely did them," etc. And I did this repeatedly, to the clogging of my narrative and in violation of my artistic canons; and I did it in order to hammer into the average human understanding that these dog-heroes of mine were not directed by abstract reasoning, but by instinct, sensation, and emotion, and by simple reasoning. Also, I endeavored to make my stories in line with the facts of evolution; I hewed them to the mark set by scientific research, and awoke, one day, to find myself bundled neck and crop into the camp of the nature-fakers. The novel has been adapted into motion pictures and sequels, animated specials, as well as audiobook format. A TV series, White Fang, was filmed in Arrowtown, New Zealand, in 1993. ^ a b c d e f Feller, Tom (January 2000). Masterplots II: American Fiction Series, Revised Edition. 6. Salem Press. pp. 2, 975. ISBN 978-0-89356-871-9. ^ Deane, Paul (1968). "Jack London: The Paradox of Individualism". The English Record. New York State. 19: 7. Retrieved March 18, 2012. ^ a b Greenwood, Robert (March 1, 2011). "Jack London's White Fang Revisited". California State Library Foundation Bulletin. Sacramento California (99): 7–13. ISSN 0741-0344. Retrieved March 18, 2012. ^ a b Wismer, Don (February 1, 1994). "Audio Reviews". Library Journal. Retrieved March 16, 2012. ^ a b Crane, Virginia (March 1997). Masterplots II: Juvenile & Young Adult Literature Series Supplement. Salem Press. ISBN 978-0-89356-916-7. ^ Carson, Gerald (February 1971). "T.R. And The "Nature Fakers"". American Heritage. 22 (2). ISSN 0002-8738. Retrieved August 27, 2011. ^ Roy Tennant and Clarice Stasz. "Revolution and Other Essays: The Other Animals". london.sonoma.edu. The Jack London Online Collection. Retrieved August 27, 2011. ^ Bianco e nero. 40. Editrice Il castoro. 1979. ^ van Gelder, Lawrence (7 February 1991). "FILMING OF `WHITE FANG` WAS A BEAR OF A PROJECT". Chicago Tribune. Archived from the original on 10 April 2019. Retrieved 10 April 2019. ^ Mark, Lois Alter (22 April 1994). "White Fang 2: Myth of the White Wolf". Entertainment Weekly. Meredith Corporation. Retrieved 10 April 2019. ^ Burgos, Danielle (3 July 2018). "'White Fang' On Netflix Has An Adorable 'Parks And Recreation' Reunion". Bustle. Retrieved 10 April 2019. Wikimedia Commons has media related to White Fang. White Fang at the Standard Ebooks site.